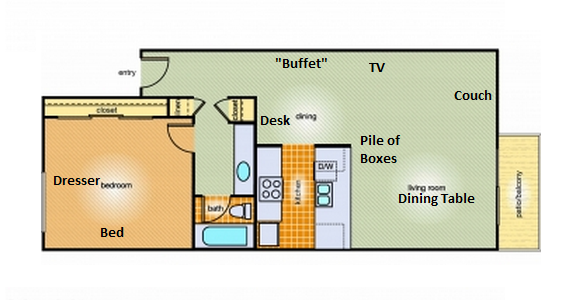 Here’s a quick little map of our floor plan that I took from the apartment’s website and modified in MS Paint. Yep, nothing but the best for you guys on this Monday morning. As you might be able to tell, We didn’t really follow the preconceived notion of where the living area and dining area should go. Creativity! I hope this gives you an idea of what we’re doin’ here! Posts forthcoming with actual photos (gasp, what a concept) so you can see our progress! I know I keep promising them but they really will be on their way. How is your Monday going? Oh, I turned 25 this weekend. Does that mean I’m a grown-up now? Haha, thanks, just keeping it real!